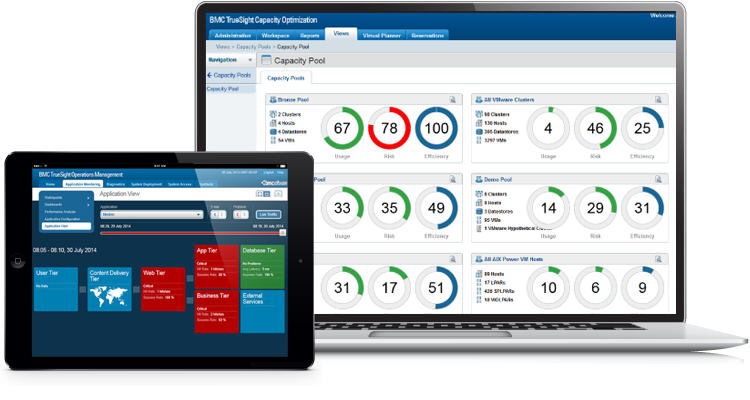 BMC TrueSight Capacity Optimisation helps enterprises to stay lean and competitive by aligning IT to business goals based on capacity usage patterns, predicted growth, and planned projects. Gain visibility into capacity utilisation at the resource, service, and business level. Support timely decision-making on IT investments. Increase agility, reduce IT costs, and minimise business risks. TrueSight Capacity Optimisation combines extensive platform support, agentless data integration capabilities, and powerful analytics to support the capacity management and planning use cases you need to modernize IT and achieve business agility. Leverage advanced analytics to plan resource provisioning and reservations, aligning to expected business growth and new business demand. Manage the capacity of all your resources, including compute (physical, virtual, and cloud), databases, storage, network and more. Get full-stack visibility into clouds based on OpenStack, vCloud and other technologies. Support timely decision-making on IT investments. Provide capacity and cost visibility to all stakeholders from a technical, service, and business perspective.